“How dare you do this!” Nabile screeched, unable to believe that she was being manhandled by two guards on each side of her into a room in the Sakhmetian palace. She had been forced up the winding stairs and into the palace from a back entrance the entire time, after struggling to escape across the whole journey of the Lost Desert. Her initial submission to the situation had quickly dissipated when she realised the enormity of what was happening and she had been a very unpleasant prisoner for the guards to ride along with. Now that she was finally being dumped into her final destination, the guards seemed eager to get away, leaving immediately without a word of response and locking the door behind them. “I am Queen of Qasala, this is simply unacceptable!” Nabile screamed after them. She felt a bit ridiculous saying that, remembering her earlier days as a thief and a commoner, but it was the only leverage she had. Even with this leverage, there was no response from the other side of the door. She knew it was futile, but she went and tried the door handle anyway. It wouldn’t even budge and after a few attempts she gave up with a sigh. Was this how it was going to be now? Her a prisoner? What was going to happen to Vyssa and Tomos? Had they been caught too? Would Jazan save her? What did Sankara plan to do with her? “This is unbelievable,” she muttered to herself. How had things gone so wrong, so quickly? Who would have thought that Princess Amira held the peace of the Lost Desert that much? She took in her surroundings and quickly realised it was not just one room, but a luxury apartment (although not the luxury which should have been accommodated to her as a queen, she noted). This was a relief, at least. There was going to be no going to the toilet in a bucket or sleeping on rags or any of that. It didn’t take a genius to figure out she was being treated nicely for a reason. Was the reason to appear kind? Lure Nabile into a false sense of security? Lure Jazan into one? Nabile was so distracted by her thoughts that she almost didn’t notice the door unlock and a figure step in. Her short dark bob and her kohl-outlined eyes were the first things Nabile noticed. The arched, almost amused eyebrows were next, followed by the thin line of her mouth. She was wearing a white dress which made her seem almost shapeless, and a small crown was atop her head, its ruby jewels hitting the light, making them appear as though they were dancing on top of her. The door remained open behind her, either as a taunt to Nabile, an arrogance of the fact she could not escape even with the door like so, or (as Nabile preferred to think) a fear for what could happen if she was locked in a room alone with her. It occurred to Nabile, somewhat belatedly, that this was only her second time properly meeting the Aisha. As meetings go, like the first this wasn’t brilliant. “Your dearest husband has declared war on us…so we cannot possibly arrange your trial whilst we are so busy.” Sankara answered. Nabile gasped. So soon? What was Jazan thinking? Did he have a plan? My coronation as King of Sakhmet will be taking place next week on the Sunday. I would like to think you would be attending, but of course I have my doubts. Nevertheless, we have done well with our plan and I owe you my gratitude. Without you, that potion to deal with Amira would have certainly come from an unreliable source. I can trust you to say nothing, for any amount of neopoints. 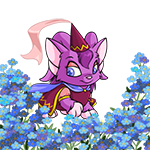 I am making Sankara my chief advisor of the military, as well as to be the Neopet who coronates me. I feel the backlash from Vyssa will make the public far more accepting as this. It was so long ago, and the people are distracted. King Coltzan is now a distant memory. Within a moment, Jazan was in front of him, eyes blazing. His sheer height dominated the space above Tomos and made him realise that his words said in anger could have dangerous consequences. He quickly took a step back and raised his hands in surrender. Vyssa and Tomos straightened up, knowing what they were being told was serious. This was now worse than they could have ever imagined. They both knew that alone, Jazan did not have the power to defeat a Sakhmetian army, backed up with the rest of the Lost Desert. Qasala was going to lose, unless they did something. “We will do it, Jazan,” Tomos said, “for Sakhmet, the Lost Desert…and for Nabile.” He took the bundle of letters and placed them safely into his back, snapping it shut after them. Vyssa and Tomos left Qasala donned in disguises, as well as a charm cast by Jazan which would hide their appearances until they left The Lost Desert. The king had also provided them with enough food and water for a month, which meant both of them had to carry huge backpacks on their backs, as well as the small leather bag containing the letters which Tomos kept safely next to his waist. They were not feeling optimistic. A mammoth task lay ahead of them. First they had to reach Faerieland and hope that worked…and then meeting everyone else, across Neopia, and convincing their armies to join Jazan’s fight? It seemed impossible, but they had to try. “We can do this,” Tomos whispered to Vyssa, giving her one of his easy smiles. “I sure hope so,” Vyssa replied, and they marched onwards out of the desert, and into their first challenge. The Haunted Woods lay ahead in the distance, a dark spot on the horizon beckoning ever closer.